NJV Government Higher Secondary School stands tall, on the Main MA Jinnah Road, even after 163 years. For all those who wonder what NJV stands for, it is named after Narayan Jagannath Vaidya, who worked with great zeal and self-sacrifice for the advancement of education in Sindh. The school was named after him to honor him for his services, and was built by Sir Bartle Frere. NJV School, housed in a beautiful yellow sandstone historic building, is one of the 600 buildings listed as a heritage site. It is the oldest public school in Sindh, started back in 1855 with 68 boys on its roll. It moved to its current location in 1876, with a total of 477 students. At one point, it even housed the Sindh’s Provincial Assembly. As the first public school in Sindh, NJV School was pivotal in providing education to the people of Sindh.To date, Akhuwat is walking the path to providing state of the art facilities to the marginalized youth. 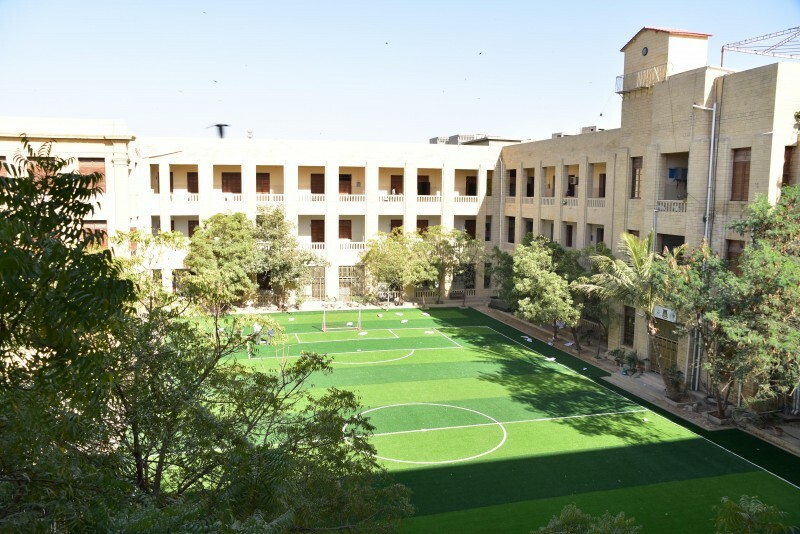 The barren ground and rooftop are amazingly transformed into astro turf football field, tennis and basketball courts. There is a cricket pitch as well. Akhuwat’s focus is not just on providing quality education, but a quality lifestyle to the students as well. Kids who attend NJV School are the ones who cannot afford the cost. Therefore, they are provided with free education, uniforms, transport, snacks and books. For now, the number of buses are not enough to facilitate all students, so transportation is only provided to the far-off residents. Akhuwat has up to date technology in the IT Lab. The science lab and library are also getting renovated.